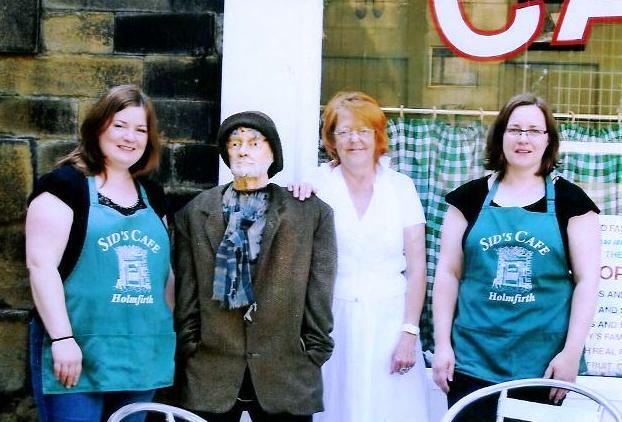 See our Facebook page to keep up to date with all the latest events and happenings at Sid's Cafe and in Holmfirth. You may remember that back in April Compo's hat was stolen, well we're happy to report he's got a new one. Many thanks to our customers Pauline & Barry from Worthing for knitting him a new woolly hat (well we think it was Pauline that did the actual knitting but we're sure Barry helped!). Thank you ever so much Pauline, the new hat looks great! The hanging baskets have arrived - don’t they look fabulous? Our favourite local band, Old Man Pie, have a record deal. Congratulations lads! The following article & photo appeared in our local paper last week. A BAND formed to play at a birthday party has been snapped up by an American record label. 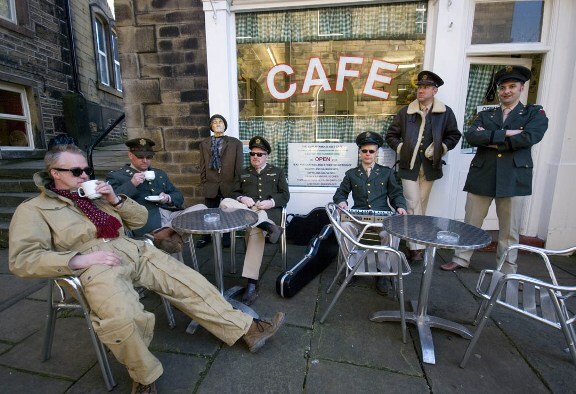 Holmfirth-based Old Man Pie is made up of six men aged in their 30s and 40s who formed to perform at the 40th birthday of band member James Munroe’s wife four years ago. But now they are recording their debut album after being signed by Pseudo Psalm Records, an alternative country music record company. Old Man Pie is made up of businessmen Martin Christie, Ian Evans, Greg Smith, designer Stuart McPearson, Adrian Barraclough who works for the Environment Agency and former web developer and dad-of-four James Munroe. James said: “We got together for my wife’s birthday and got a better reaction than we imagined. So we carried on playing together at friends’ parties and doing cover songs. “Martin writes his own songs, so he brought a few of them along and we started playing them and gradually added them to our set list. But much of their success is down to the internet. The band formed their own website and thanks to the skills of designer Stuart they are getting more than 30,000 hits every time they put a new animation online along with one of their songs. News of the band spread and they were contacted by Pseudo Psalm Records based in Indiana who specialise in alternative country music. James added: “Initially we were a bit gobsmacked. We’ve been recording music over the past few years so have picked our favourite tracks and sent them out to the record company to have a listen to. Their debut album Old Man Pie is set for release on June 16. Rumours abound that Last of the Summer Wine is to be axed by the BBC. Juliette Kaplan who plays Pearl posted the following on her website. Please follow her suggestion and write to the Director General Mark Thompson at the BBC if you want to save the show. IT'S TRUE! THE BBC HAS AXED US. WE SHOT 11 EPISODES FOR SHOWING NEXT YEAR AND THEY'RE ONLY SHOWING ONE!!!! OUR VIEWING FIGURES ARE IN THE MILLIONS. DO YOU WANT TO SAVE THE SHOW? IF ALL OUR VIEWERS GET IN TOUCH WE MAY BE ABLE TO DO SOMETHING. We are pleased the new series (series 30!) of last of the Summer Wine has started again on Sundays on BBC1 - starting about 6pm or 6.30pm - start time varies weekly. The cafe was featured in Episode 2 with Marina staging a "Down with Men" protest outside the cafe whilst sitting in a shopping trolley!! Here's a photo we took during filming last summer. Compo's woolly hat was stolen last week. His pale green woolly hat was stolen from right off his head outside Sid's Cafe. If anyone has any information about the culprit or whereabouts of the hat please let us know. Don't worry about Compo keeping warm - our Dad has very kindly lent him a hat until we can get him a new one. If anyone fancies knitting him a new one that would be much appreciated. ...and here's one of the stolen hat! On top of that our Staff Tips jar was stolen from off the counter last Thursday - is this the start of a crimewave at Sid's? We’ve had some sunny spring days this past couple of weeks though we were treated to another snow storm on Sunday! Here’s a photo of Sid’s Cafe in the snow in February - the snow was so bad we closed for a day! Holme Valley in the snow Feb 09 - Looking down to Holmfirth in the valley bottom, from Winney Bank Lane.